Windhoek-Namibian livestock producers contributed 45 percent of the total agricultural income for 2017 and earned a whopping N$3.4 billion from the sale of cattle – a drastic increase of N$1.4 billion compared to the N$2 billion earned by cattle sales in 2016. But despite these impressive figures, the Livestock Producers Organisation (LPO) has expressed serious concern about the sustainability of the export market of beef from Namibia. The LPO has already started to investigate how an optimal processing and marketing organisation should be composed to be sustainable in the long run, and in which producers are directly involved in day-to-day operations. Plans for such a body – which will emphasise the worth and impact of the livestock sector and provide information and statistics as a baseline to guiding sustainability towards 2030 – have reached an advanced stage and more details will emerge after a proper sustainability study has been completed. Confirming the bold new move, chairperson of the LPO, Piet Gous, says it is critical for the Namibian economy that this industry stays healthy and sustainable. “The vision of the LPO is that all three markets which are currently served, namely the EU export market, the local market for beef as well as the export market of live cattle mainly to South Africa, are of vital importance to ensure a fair price for producers,” he remarks. The LPO management last week visited role players in the South African meat industry to get a better picture of the value chain to which Namibian weaners are delivered. The South African beef industry annually slaughters about three million cattle, of which 87% is A grade. The cattle are mainly from feedlots, which are vertically integrated in the total value chain and deliver a final product to the retailers. Exports of beef from South Africa (SA) in the previous year during the drought was close to 50,000 tonnes. Due to the stabilisation of the rand, exports are not that competitive anymore, and it is expected that exports will this year decrease and that this export meat will have to be absorbed in the SA market. Due to the relative low maize price, meat, which is produced under intensive circumstances, is now available in the market at a very competitive price. The ailing economic conditions force consumers to rather buy cheaper chicken and pork to replace beef. Weaners, however, are still in high demand due to the reduction in SA cattle herds, and it is expected that the weaner prices will stay competitive for the next two years. An oversupply on the local Namibian market due to emergency sales may force prices downwards in the short term. 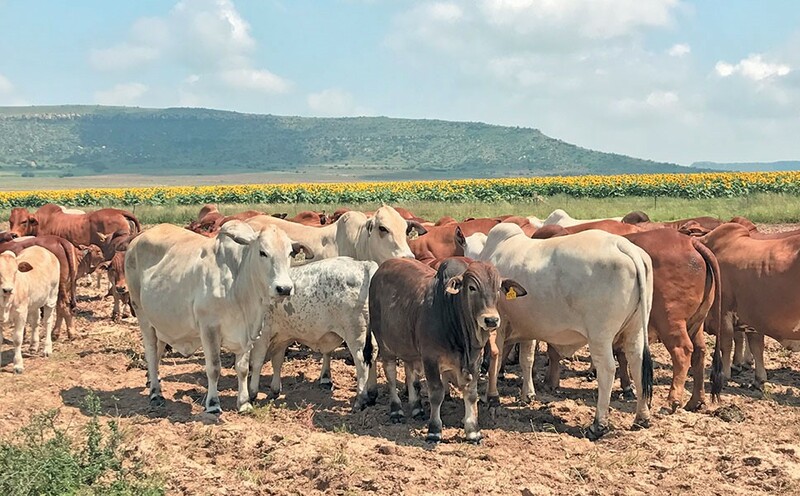 A total of 421,000 cattle were marketed last year of which 313,000 have been exported to SA feedlots and 107,000 have been slaughtered locally. A definite shift away from slaughtering at export abattoirs in favour of local abattoirs was noticed. Various reasons could be offered such as higher prices and less compliance costs. The total cattle marketed increased with 30% on a year to year basis, mainly as a result of the number of weaners exported to South Africa. Weaner exports were mainly driven by a favourable price hike of 34% (based on N$/kg) on a year to year basis. It is important to note that slaughter cattle and weaners serve two distinct markets and that the two types of cattle cannot be interchanged due to different market specifications. The average price a weaner fetched in Namibia was N$25,00 per kilogramme live weight, while the average B2-grade carcass price at the export abattoirs was N$36,00 per kilogramme carcass weight. Cattle carcass prices increased with a 16% (based on N$/kg) increase on a year to year basis. In total, only 7,300 tonnes of beef were exported, resulting in a decrease of 32% on a year to year basis. “Smart farming is the new approach to farming. This means the increased precision farming of livestock, with detailed record-keeping of all farm matters. Another aspect of smart farming is the use of technology. Modern farming could be much more profitable if such resources are used to the maximum,” he adds. “A motivated workforce is of the utmost importance to unlock the potential of agriculture,” he concludes.